"Thank you for visiting MicroDigital." In vitro diagnosis medical device business is quintessential in promoting quality of medical care, and requires collaboration of biotechnology, electrical engineering, and mechanical engineering. Biotechnology and environmental technology markets are also growing with growing concern for the world that we live in, but unfortunately Korean progress in these fields is not keeping up with the needs. 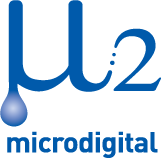 MicroDigital has worked with years of development experience, patents and research capacity to develop and supply reliable and convenient products. MicroDigital aims to be the leading company in these fields through continued investment and research, to ultimately become a global company.